1. 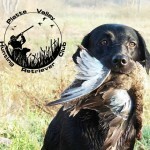 The primary purpose of these leases is for retriever training and club activities. 2. Be courteous to fellow members using the grounds the same time you are, i.e., do not drive through the middle of their tests or patterns, or crowd them by working so closely that you bother their training. 3. Each member or guest assumes his/her own responsibility when acting in such a way as to be in violation of any state or federal game and fish laws. 4. The PVHRC Inc. does not assume responsibility for accidents that occur on the premises that the club has a lease on. 5. The East Pond is available for retriever training at any time throughout the year. However, it typically only has water during the spring and summer. 6. A member may bring up to three guests to the grounds, but the same guests should not train on the grounds more than one time without joining the club. No guests may be present on the ground unless their host member is with them. 7. Members need to carry their Platte Valley Hunting Retriever Club Membership card at any time they are using the proper­ty. The landowners require this so that they can check for trespassers. Members should check the cards of those they do not recognize. Being able to continue these leases will be dependent on how we treat them, so keeping trespassers to a minimum is important. 8. Use of shotguns is allowed for dog training. Proper safety procedures in gun handling must be exercised at all times by members and guests. Do not shoot within 200 yards of Mary’s house or buildings. Please be considerate. 9. No alcohol is to be consumed prior to or during training or when firearms are in use. Alcohol consumption may be prohibited at other times as specified by the club in accordance with accepted HRC Hunt procedures. 10. Stay on the designated roads and trails at each property. Do not drive on land planted in growing or unharvested crops. 11. FIRE SAFETY. Don’t park vehicles in dry grass; the catalytic con­verters on the exhaust pipes get very hot and can cause a fire. Be careful to extinguish cigarettes in grassy areas. 12. Avoid any livestock on the properties and try not to disturb them. 13. Hunting is not permitted on these grounds. Any specific exceptions will be determined and administered by the PVHRC officers and board. Camping is not permitted on the grounds. 15. Do not litter the grounds. Do not leave dead birds or empty shotgun shells on the grounds. Take them and your trash with you when you leave. Pick up your fluorescent orange tape after running blinds. 16. Motorcycling is prohibited on the grounds. 17. Clay bird shooting and all forms of target practice are prohibited, as is the discharging of rifles or pistols (blank ammunition OK). 18. These leases are very important to the club and its members. Flagrant or serious abuse of these rules will result in expulsion of the member from PVHRC as provided by article IV of the club’s by-laws, and exclusion from further use of the properties.